Some of you might have already seen this in the Singapore papers a couple of weeks ago. 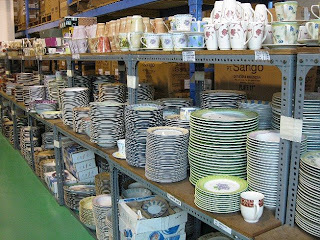 If not, then here is a nice little secret to get beautiful crockery at (incredibly) marked down prices. After reading about it, I made a mental note to visit Java Factory Outlet soon. I brought along a friend who is familar with the place. The outlet is nestled in an industrial area, not the usual shopping haunts. When we arrived however, we were not disappointed. 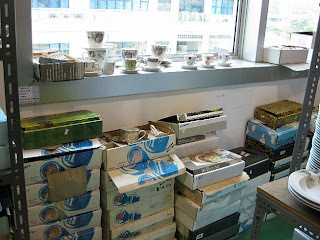 We were greeted with a HUGE warehouse "room" with rows and rows of ceramic tableware and incredibly cheap prices. More so now that they are selling everything at 50% off the already low prices. There are tableware sets, and also many individual pieces you can buy to mix and match. Granted, not everything was beautiful. There were many well-made pieces but in designs that were rather dated. We were also perspiring in the non-air-conditioned and rather dusty place, held in awe by the things around us. Surprisingly, after spending more than an hour there, I emerged with a paltry 4 Christmas themed platters, and a set of coffee cups and saucers (because I don't have one). My headache got to me and I couldn't make up my mind what to get for a friend's new green and white themed apartment. I think I will go back - or better still, take her along! I bought most of my tableware from this place! It was a treasure trove and thank God it was enroute from church to "home" then. 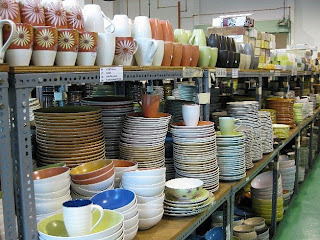 i love crockery but DD has forbidden me from buying any more. sigh! i don't even think we have much. the selection look overwhelming though and i think i'll prob not emerge with much either! u made the trek there! well done!! !